GBP cap and t-shirt will be sent for all donations (*) from 50 euros up. Click here to see in detail the color of the caps and t-shirt. Under the Aug, 1rst 2003 law, persons and businesses are allowed a fiscal rebate for their gifts to charities. As a gesture for the common good, gifts to charities are entitled to a fiscal rebate of up , (if you are taxable in France,) a tax reduction of 66% of the donation (within 20% of your taxable income). Many countries concede their nationals fiscal advantages if they make a present of money for associations. GBG delivers a certificate for all gifts it receives in order to allow Givers possible discounts on taxes. Warning: sponsors are invited to check previously if the countries where they reside allow such fiscal discounts or other advantages. Donate! Please complete the fields below. The name, surname, email address and country are mandatory. Once the information is true, you’ll be redirected to the website of the Credit Mutuel bank with secure payment. If you want a tax receipt, please send your request by specifying the date of your donation by mail to. Take part in our actions. Invest some of your time as a GBP volunteer. 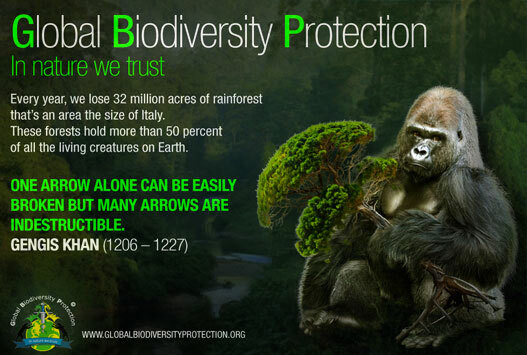 2) Spread the actions and name of Global Biodiversity Protection. 4) Introduce us to sponsors who would offer their products, services , or financial help..
100% of public contributions are invested into the achievement of Global Biodiversity Protection projects . Thanks to the generosity of private investors, and the direct financing of GBP actions their gifts allow, this policy will be made possible. Thanks to your gifts, we will strengthen our actions in order to protect and nurture biodiversity where it suffers the most, especially in Africa where drought triggers a range of fast spreading damages which endangers plant, wildlife, and crops. We are happy to strive for the setting of a better world to live in for our children and the future generations to be.